Join us on a walking tour of this district with the City urban designers behind this initiative. 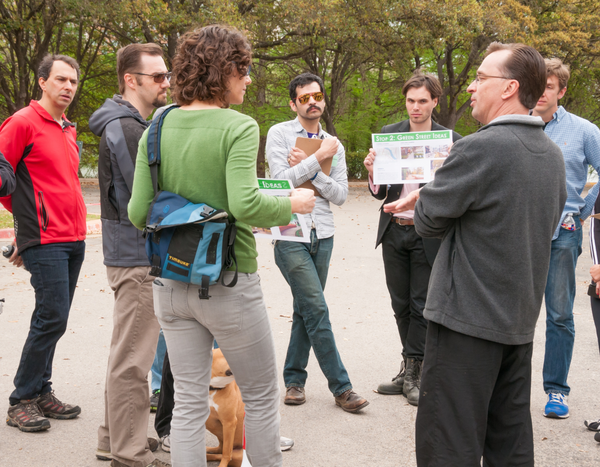 As we walk, you’ll get a chance to hear leaders in urban design, transportation, and economic development. Big changes are coming to the South Central Waterfront District, just across the lake from Downtown Austin. The South Central Waterfront (SCW) Vision Framework Plan envisions a new network of green streets and blocks, open spaces and trails, and public plazas to provide a compact and connected physical framework to accommodate a projected increase in density. Join us on a walking tour of this district with the City urban designers behind this initiative. As we walk, you’ll get a chance to hear leaders in urban design, transportation, and economic development discuss the unique implementation strategy to leverage development incentives and public funds to create the open space network and much needed affordable housing in this District. Participants will gain an insight into the cross-disciplinary collaborations that shape the urban design process and the challenges of implementing a long term vision that is unique to Austin. We’ll start and end at the new Temporary Public Plaza at Barton Springs and Congress Ave for the Panel discussion. This itinerary includes the exciting opportunity to experience the future Bouldin Creek Trail through the Texas School for the Deaf and learn about some upcoming developments in the District. Paid parking is available on street on Barton Springs Road, at the Hyatt Regency Parking Garage, and at the Statesman Bat Observation Center / Congress Ave Bat Parking.